The Bloomsbury Flower Show in Russell Square. 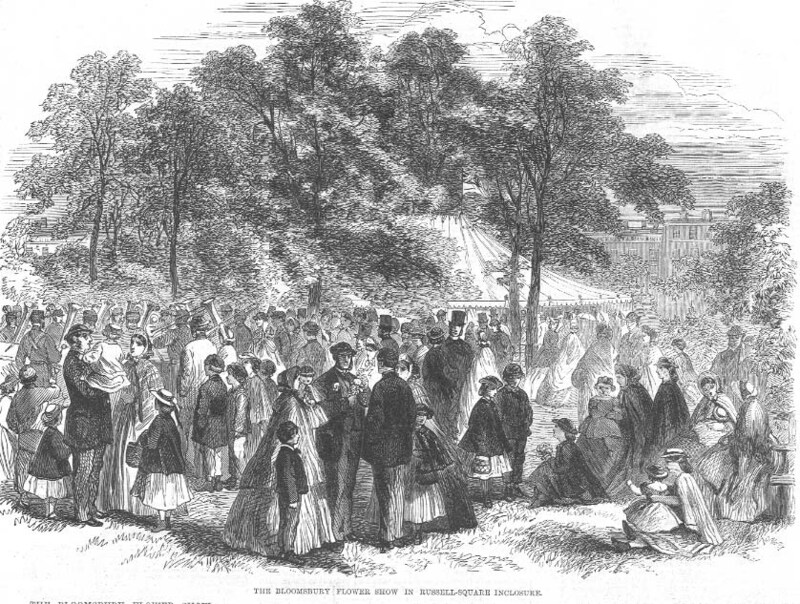 We give an Illustration of the annual flower show held in the gardens of Russell-square with a view to encourage the taste for cultivating flowers among people of the working class in the parish of St. George's, Bloomsbury. This pleasing exhibition took place on Wednesday week. A large tent, as shown in our Engraving, had been erected in the grounds, and this was abundantly decorated with fuchsias, geraniums, annuals, and various other flowers and plants. The company consisted, for the most part, of the poorer inhabitants of the parish; but among the more distinguished visitors were the Earl of Shaftesbury, Sir S. Morton Peto, Bart., M.P., Mr. Payne, the Hon. Arthur Kinnaird, M.P., Miss Twining, the Hon. Misses Ashley, Mr. W. Hawes, and the Rev. Emilius Bayley, Rector. All present seemed to enter most heartily into the pleasures of the scene; and the laudable arrangement which caused the customary barriers of exclusiveness to be thrown down for the time, and the gardens to be opened to the poorest parishioners, was evidently much appreciated. It appears that the system of exhibiting flowers under the present circumstances has rapidly increased in public favour; and whereas in the first year only 140 plants were entered, nearly 800 were now registered, and 400 persons had given in their names. The prizes, varying from 1s. to 10s., were distributed by the Earl of Shaftesbury, who delivered an address expressing the delight he felt at the character of the exhibition and pointing out the many advantages that must arise from it. But it was not alone for the best display of flowers that prizes were awarded. The owners of clean and tidy rooms were also honoured, and these competitors received rewards varying from 10s. to £2. Lord Shaftesbury, in presenting them, congratulated the parishioners on the progress they had made in adopting measures for the preservation of their own health, and for the extension of a salutary example to others. For the prizes in respect to the possession of clean and tidy rooms, 800 names were entered, and the Rev. Mr. Bayley and his curate had paid no less than 600 visits in the space of six weeks, in order to ascertain who amongst the occupants were best deserving of rewards. The competition was confined exclusively to the inhabitants of the parish, both as regarded the exhibition of flowers and the prizes for clean and tidy rooms. It should be observed that none of the flowers were cultivated in conservatories or elaborately-trimmed gardens, but in bow-pots and wooden boxes fixed on the window-sils of the humblest parishioners. Two bands of music were in attendance—that of the E division of the Metropolitan Police, and that of the 37th Middlesex volunteers—and when the distribution of prizes had been completed many of the younger part of the company amused themselves with dancing.